The green, 25' L-4E6S Star Quad XLRM to XLRF Microphone Cable from Canare is especially designed for handheld microphone applications in live sound, rehearsals and other situations. In addition to mic-level signals, the cable can also be used to carry line-level signals such as for connecting your mixer to power amps. 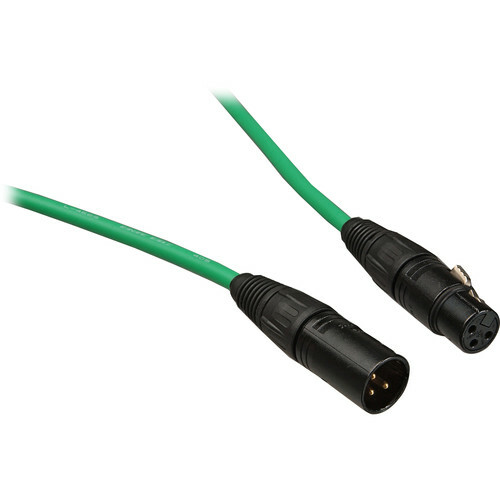 Box Dimensions (LxWxH) 10.0 x 10.0 x 2.5"
L-4E6S Star Quad XLRM to XLRF Microphone Cable - 25' (Green) is rated 4.7 out of 5 by 52. Rated 5 out of 5 by Jeremiah from Love the color coding Sam Mallery who makes a lot of technical videos for B&H recommended these videos at his blog (what to get for an audio professional). The manufacture seems top notch and I love the ability to match mics to my mixer using color coded cables. And hey, who doesn't like a little color. Ask me in five years how durable they are, but the specs are top notch and the components name brand. I'd rather not worry about my cables on a shoot. I've purchased 4 Canare cables and my review is the same for all of them. Rated 4 out of 5 by Film_Video Production Teacher from Just fine. Used by video production students. Meets one's expectations for a solid, no-noise cable. Rated 5 out of 5 by Edmund W from excellent quality Some years ago I was looking for a colored mic cable for the church I attend to make it easier to keep track of the mics as people move them around and I was directed to canare. After weekly use and some pretty rough handling by inexperienced people, these cables have not failed. So now that I am in the process of putting together my own portable sound system I went with this brand knowing that these cables wont let me down; besides the bright true colors makes it lot easier directing performers to which mic you want them to use. Rated 5 out of 5 by Prof Chuck from Nice Cable - Color coding great Bought 4 different colors so we could identify mics easier and what cameras they should be plugged into for interviews. Worked great. The cables are light, sturdy, and easy to coil. Wish they had a 30 ft length, but the 25 foot worked well. Used for 3 & 4 camera shoots of interviews and other shooting. I am not a musician, but, a TV-Film Director. Rated 5 out of 5 by rob from Exquisite Cables These are no name cables to me (means I have never heard of them before)... but they are lovely. Super nice. Great connectors, very nice cable jacket, great color options, great price. What's not to love? I do have some Mogami and they are nice also but much more expensive. Full disclosure...... I am not a cable snob. A lot of my other gear is super high end but it's hard for me to get too excited about cables. That's why I think these are so nice...... great cable, great price. Highly recommended. Rated 5 out of 5 by Photog Mickey from Great quality You could order all the parts to make this cable and save some $ or order this cable and save your time. Rated 5 out of 5 by Anonymous from Better cable, no way I have played professionally for several years. In that time I have used a lot of different brands of mic cables. I started using the Star Quad L 4e6s cables a couple of years ago. This cable has made a believer out of me. the cable is superior to anything you can get now days and the Neutrik connectors are Kind in the industry. These connectors are indestructible . Better cables out there, no way. Will the green Canare L-4E6S Star Quad cable work on a green screen set? Basically is it close to standard chroma green in color (if there is a standard)? There is not a specific chroma green xlr cable. This would be as close as as possible. What type of connectors ? Are those Neutrik ? Yes, the L-4E6S Star Quad cable includes Neutrik XLR connectors. Does the cable itself say made in Japan or China? The cable is labeled MADE IN JAPAN in white directly on it.